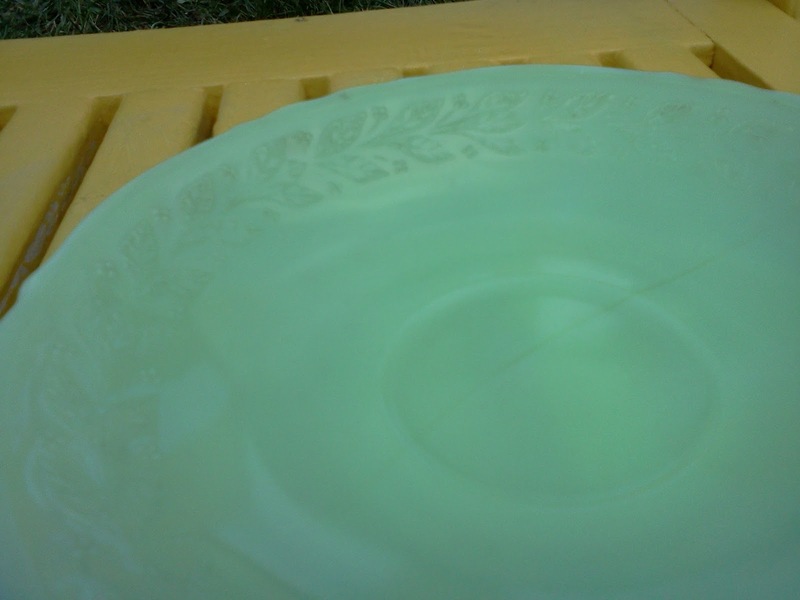 Yesterway: Pyrex and Jadeite and Hoosiers - Oh My! Hello all and many apologies for being slightly MIA as of late. As a college student my semester is beginning to come to a close bringing with it many fun finals and term projects. Trust me when I say I would much prefer thrifting and blogging to this alternative...not that I wouldn't prefer it to most other alternatives, but especially so in this instance. In fact right now I am stuck on campus, coffee in hand waiting for my next class - a perfect opportunity to play catch up. 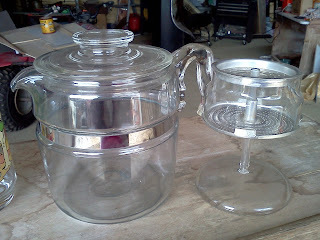 The upside to this arrangement is the amazingly quick upload of photos. First up we have some goodies I found a while back. 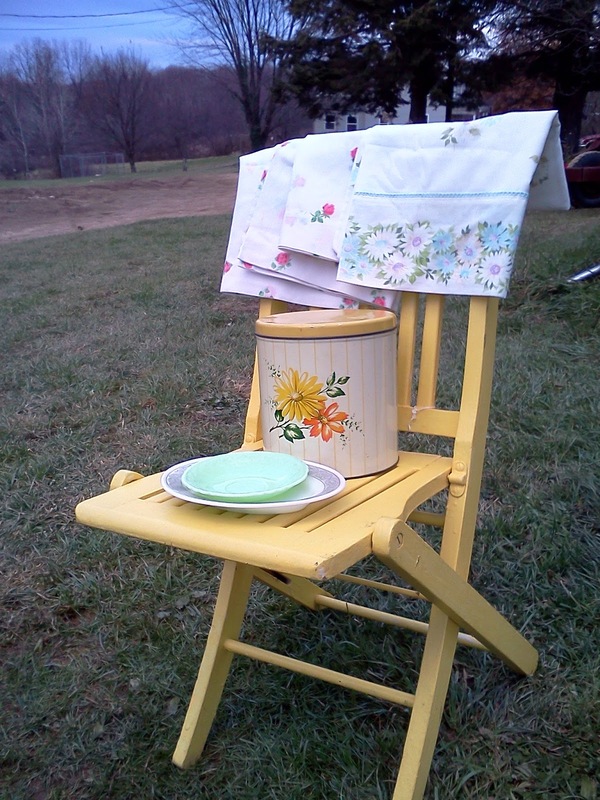 Remember the yellow folding chair I mentioned I found at a rummage sale, well it decided to cameo as a prop in these photos. On the top are four floral pillow cases I found ranging from 25 cents to a dollar each. 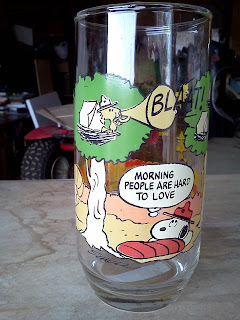 Oddly enough three of these match and were found at separate Goodwills. 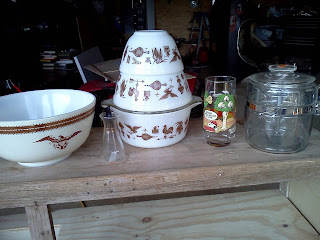 I also found the metal canister with darling flowers printed on it for a dollar. 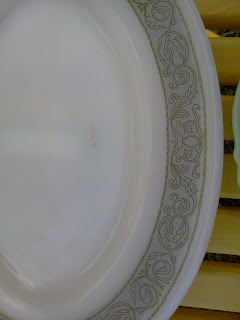 The two plates were found for less than a dollar each. One is a Pyrex dinnerware one with a neat-o gray with green style design. Although somewhat unrelated to the thrfting share time I'm in the middle of, I did make some more progress on my Hoosier cabinet. The top section of it is now fully reassembled aside from the back panels and doors. 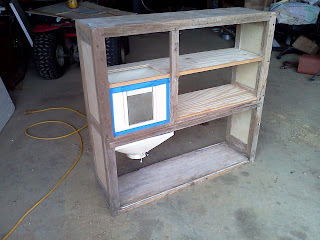 Once it and these pieces are all stained, they can be put on and the top section will be completely done. I can't begin to explain how excited I am to have made this much progress on it. It's to the point now where you can really begin picturing it as an eye-catcher. Well that's all for now folks, off to class I go. Happy thrifting! 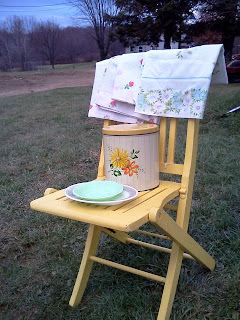 Also, I'm linking up over at Thriftasaurus! I am not normally a fan of the Early American pattern but seeing your stack bowls totally changed my mind! I think I just don't like the brown with gold graphics. Now I'm on the search for my own bowls like yours!